Get to know: Rhea of Photosynthesis Floral Design — Campfire & Co.
We are excited to introduce you to our good friend and incredibly talented designer, Rhea Calpeno of Photosynthesis Floral Design. Rhea will be co-hosting our GOOD VIBES ONLY workshop next week! Tickets are limited, so make sure to reserve your seat! Rhea is truly a woman after our own hearts, using her background in interior design to inspire her whimsical and wild floral arrangements. We can't get enough of her penchant for rich color or her Instagram feed full of lush, organic art . Read on to learn more about Rhea, her path to master of flora, and best practices when foraging! One of the things that Campfire & Co. loves about your story is your background in interior design! Can you tell us a little bit about how your path as designer shifted towards florals and what aspects of your background influence your work today? Yes, I started out in interior designer and worked in the field on and off for around 13 years. After graduating from VCU, I started working as an interior designer at a firm in town. My first exposure to floral design was helping create arrangements for the openings of some of our projects. I fell in love and shortly after gave my notice at the interiors firm and started the first iteration of Photosynthesis focusing on florals and styling for photoshoots. At that point, I was in my mid 20’s and a bit of a free bird so I decided to move to NYC. The market in New York was tough so I kept my options open with jobs, ultimately landing an interior design job at high end residential design and architecture firm. Fast forward 5 years and I moved back to Richmond. When I contemplated the move and what I wanted to do professionally, floral design just felt right and that was how Photosynthesis Floral Design was born. I think all of our past experiences are helpful to us in ways that we wouldn’t necessarily expect. New York is one of the world’s creative epicenters and in addition to honing my design eye, working there taught me to push things further than I had before. It was there, that I truly learned how important it was to pay close attention to the details. It’s the little details that will set you apart every time. There is a huge amount of crossover with interior and floral design. Aside from the mundane but necessary similarities in needing to manage logistics and information, there is also the very personal element of collaborating with your client to help actualize their design dreams even if they don’t quite know how to vocalize them. My interiors background has been particularly helpful when working on the florals for weddings + events because it comes naturally to me to take the whole environment into consideration when planning with the client. What is one of your favorite projects or collaborations from the last year or so? 2015 was a great year! 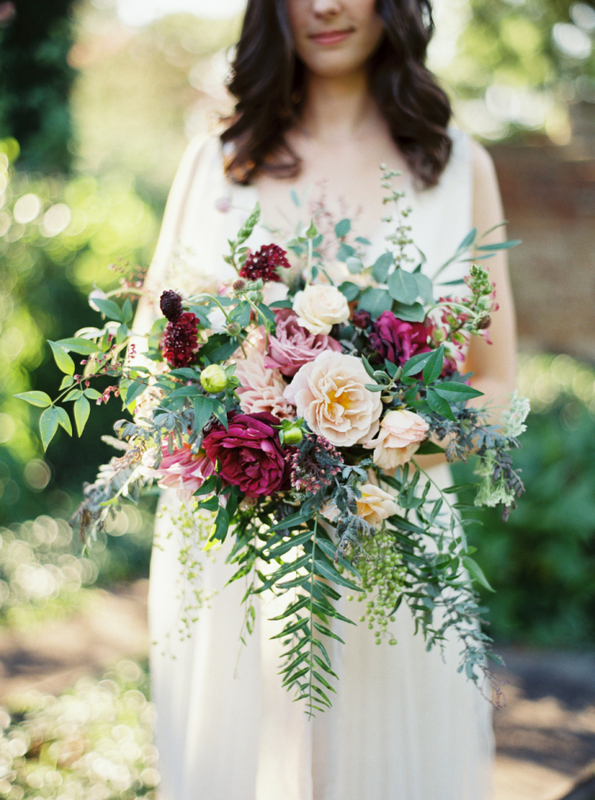 One of my favorite projects was creating the florals for a styled shoot with Kate Ignatowski Photography. Kate is wonderful to work with and has a knack for providing the perfect amount of artistic direction and creative freedom. The shoot was featured on Style Me Pretty. Yay! As a full-time boss babe, you've got a lot on your plate. What's your favorite thing to do to unwind after a long week? Life is certainly busy as a small business owner. I am honestly trying to learn how to have a better work-life balance. Mostly you can find me cooking, dining out or biking around the fan with my beau. Anything new on the horizon for Photosynthesis Floral Design? I am really excited to start regularly doing workshops! Thanks Rhea for sharing your story with us! We are so excited to collaborate with Photosynthesis Floral Design to host our next GOOD VIBES ONLY workshop! Our floral workshop is next Wednesday, April 20th from 6 - 8 PM. You will learn Rhea's expert arranging tips first hand and while creating your own centerpiece and flower crown. We'll also provide snacks and wine because we think those are the magic ingredients for a fantastic Wednesday evening among friends. Tickets are limited, make sure to reserve your seat! All images above, unless otherwise noted, are courtesy of Photosynthesis Floral Design.